Time pressures and accountability have caused many educators to look seriously at the way they use class time. One of the results: many teachers are not reading aloud to students as much as they did in the past. Educator Brenda Dyck reflects on the power of reading aloud to middle school students. Included: Resources for helping teachers re-establish "read alouds" in their classrooms. I've just about finished reading From the Mixed-Up Files of Mrs. Basil E. Frankweiler to my grade 6 students. I admit this rather sheepishly because I am not a language arts teacher -- I teach math. The truth is, I really miss the bonding experience that goes with reading aloud to students. That's why I've been reading to them in homeroom or whenever we can grab a few minutes. They beg me to read. They frequently ask me what we will read next. Are you reading to us today? We haven't been read to since grade 5. I love being read to. I've been thinking about the book. If Claudia and Jamie spent $3.00 a day at the museum, wouldn't they have run out of money? When was that book written? I figure it had to be a long time ago, since a newspaper only cost 10 cents. WHAT IS IT ABOUT BEING READ TO? "When you get older, no one ever reads to you in school. "I love your voice. It helps me picture what's going on in the story, and I don't have to struggle with figuring the words out." "It's so relaxing. It helps me settle down so that I can work later." I asked my colleagues if they were reading aloud to their students. I learned that few teachers felt they could take the time, even though they wished they could. engages listeners while developing background knowledge, increasing comprehension skills, and fostering critical thinking. models the use of reading strategies that aid in comprehension. exposes students to books beyond their reading level. I've discovered that the books we read to our students can have a life that goes far beyond the classroom. Reading The Mixed Up Files of Mrs. Basil E. Frankweiler has unleashed a dream in one of my students. Because of her strong interest in this book, she and her mother are currently planning a trip to the Metropolitan Museum of Art, the setting for the book. She tells me the book started it all. "Will you write the name of the book and the author down, please? I want to read it on my own." A few days later, while reading to the class, I looked up, and there she was, reading along with me. She had bought her own copy of the book! That must be what author Thomas Carlyle meant when he wrote, "The best effect of any book is that it excites the reader to self-activity." 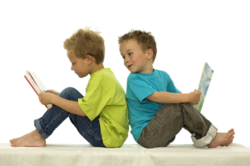 Read Alouds: Is It Worth It? Education World explores the benefits of reading out loud to students. Read about teachers who are making time to read to students in the older grades.